Mentor Graphics has spent much of the last two years extending the capabilities of its Xpedition PCB software along the lines of a chip-to-package-to-board design flow. It was inevitable once that work was complete, the company would turn to address the other side of the process, the growing challenges raised by multi-board designs as systems of systems (SoS) proliferate. The formal announcement came a few weeks ago and we have just had a chance to sit down and discuss the innovations with Dave Wiens, Product Marketing Manager in Mentor’s Systems Design Division. Xpedition has been extended with capabilities aimed at not only the system architect and the PCB designers working from his direction but also into areas such as cabling, manufacturability and more. Wiens describes the process as one of “both integration and automation”. On one level, Mentor is bringing a clutch of existing products still closer together. In cabling it has the well established Capital software. In manufacturing, it has Valor. SystemVision is another recognized play but more on the mechatronics side. All of these – and more – make key contributions to the Xpedition SoS flow. But there has also been a clear attempt to address an emerging SoS market that is not merely straining but has arguably already breached the capacity of traditional methodologies. Nevertheless, you can take the traditional architect-PCB designer relationship, and how Mentor is looking to improve that, as a good example of the philosophy at work. “At the architectural level, these guys don’t want complicated tools. They’ve only just graduated from paper and they’re still using fairly straightforward software. They might be using [Microsoft] Visio as a drawing tool (some even use PowerPoint) and those have limited intelligence within them in terms of how you manipulate the object,” says Wiens. So capture a clearer system definition from the outset and there are clear opportunities through integration and automation to save plenty of time and heartache, speeding up the handoff to the PCB design team. Here’s another example, but this time for cabling. “You might just want a ribbon cable in some instances, but what if you’re talking about 25Gbit/s communication. Now the architect needs to be able to clearly indicate constraints to the cable designer – that cable had better be differential pair, well shielded and so on,” says Wiens. It’s all very practical stuff, but where will Xpedition go next. “We do want to do more on the architectural side, breaking down the abstractions there – concept development, features, functions, and system decomposition,” says Wiens. But then there is also the question of Siemens’ recent recommended bid for Mentor and its impact. “Obviously where we are going with Xpedition brings us closer to that PLM and factory area where Siemens is a massive player,” says Wiens. 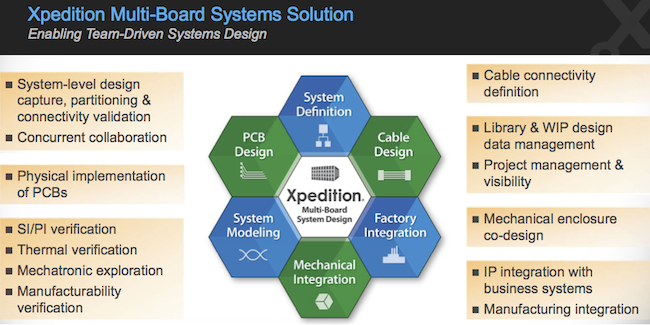 The Xpedition multi-board systems design solution is available immediately. More information at http://www.mentor.com/pcb.